I was so excited to make this dessert for Amy's birthday that I delivered it an entire day early! I left it on her desk this morning before she arrived, only to have her come to me a few minutes later to tell me her birthday was actually tomorrow. I felt like such a dork! I tried to encourage her to celebrate her birthday-eve instead, something my sister always celebrated because her birthday was on New Year's Eve, but she wanted to wait until tomorrow and who could blame her? Several coworkers commented, wondering where dessert/breakfast had gone but I assured them that it didn't disappear and that it would be back tomorrow. Yield: I plan to serve this in very small servings at work but under normal circumstances it would probably serve about 10-12 normal sized servings. This recipe could easily be doubled. In a bowl, beat the cream on your mixer's highest speed until soft peaks form. Add the powdered sugar and 1/2 teaspoon vanilla extract or paste and mix until well combined. Transfer the whipped cream to a different bowl. Using the same mixing bowl (you don't have to wash it), beat cream cheese, peanut butter, sugar, butter, and vanilla until smooth and very, very light. This will take at least 2 minutes on medium speed. Slowly fold in half of the whipped cream into the peanut butter mixture and set aside. To assemble the desert, start with a layer of 6 cookies in the bottom of the bowl or a plate. Spread about 1/2 - 3/4 of a cup of peanut butter cream on top of the cookies and use a rubber spatula to evenly spread it out. 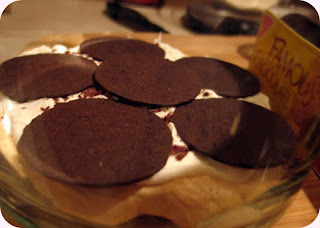 Top with a thin layer of whipped cream, smooth out, and top with a layer of cookies. It's okay if the cookies don't touch. When you run out of cookies, top with a final layer of peanut butter cream and whipped cream. Top with chocolate curls, crushed cookies, or nothing. Let it sit in the fridge for at least 8 hours. This will give the cookies adequate time to soften. Note: If you want to save some calories and fat, you could use non or reduced fat cream cheese, a reduced fat/sugar peanut butter, reduced-fat margarine, low fat chocolate cookies, and non-fat whipped topping instead. I can't vouch for the taste but it would probably turn out okay. Your "birthday eve" comment made me smile...we always say that around our house..."happy birthday eve!" ohh that looks lovely! 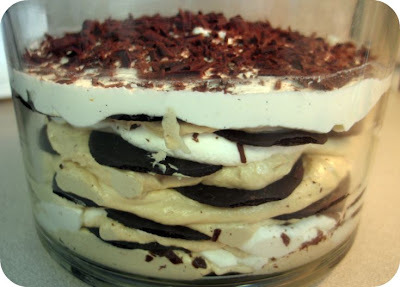 i've never tried an icebox cake, but I love my trifle bowl and am always looking for other reasons to use it... this looks like the perfect excuse :) and does it ever get any better than PB and chocolate?! Just wanted to say thanks for the yummy treat today….I’m going to have to burn it off during Jazzercise tonight!!! :-) It was so good…I’m eating my last bite now. The first thing I thought was "Peanut butter? That will be *heavy*." The lightness of the peanut butter whipped cream caught me by surprise. The entire dessert was a fluffy delight, with the crispness of the cookies providing a nice offset from the texture of the cream. 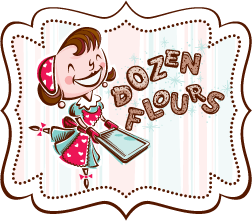 When you made your whipped cream, did you make sure that the cream was really cold and the whisk or beaters and the bowl were chilled before hand? Also, did you add anything to the cream prior to it getting to the soft peak phase? If you added any sugar or extract before it gets thick, that could keep it from whipping all the way. Some other things that can keep the cream from whipping is not whipping it on super high for long enough. Depending on the speed of your mixer, it could take 3 to 8 minutes to really whip it. And lastly there are some brands of cream that I find impossible to whip - this include Lucerne (Safeway) or other brands. I stay away from Horizon brand too. I hope that helps. Worst case, tomorrow the icebox cake will just have the consistency of pudding instead of cheesecake. It should still be yummy. Thanks for testing this one out! Please let me know how it goes. BTW, what do you think of the pink argyle? I'm still on the fence. I made this for a dinner party this past weekend and have had several requests for the recipe already. I sent them the link to your blog. It turned out great! I also loved that I could make it ahead and forget it. Great idea! I will definitely make this again, probably around Easter! Hi Jennifer - that's so cool! I am so glad the you liked this one. I'm a big fan of desserts that you can make ahead of time. If you're a big fan of chocolate, you might like this Ultimate Chocolate Trifle too.